South East Asia has firmly established its name as a hub of global economy and entertainment. A dip in the pristine waters of Thailand, a stroll through the vibrant beaches of Pattaya, a glimpse of the sweeping rice fields in Vietnam, a walk along the Great Wall of China - tourists have a lot to discover in these countries. Moreover, as many companies expand their business in the Asia Pacific region, the number of business tourists traveling to Asia increases as well. In order to cater to the needs of the international travelers, Asian Airlines have taken the onus to redefine luxurious flying in the area and thus, for upscale travelers, the Oriental experience can begin long before they step on board the plane itself. 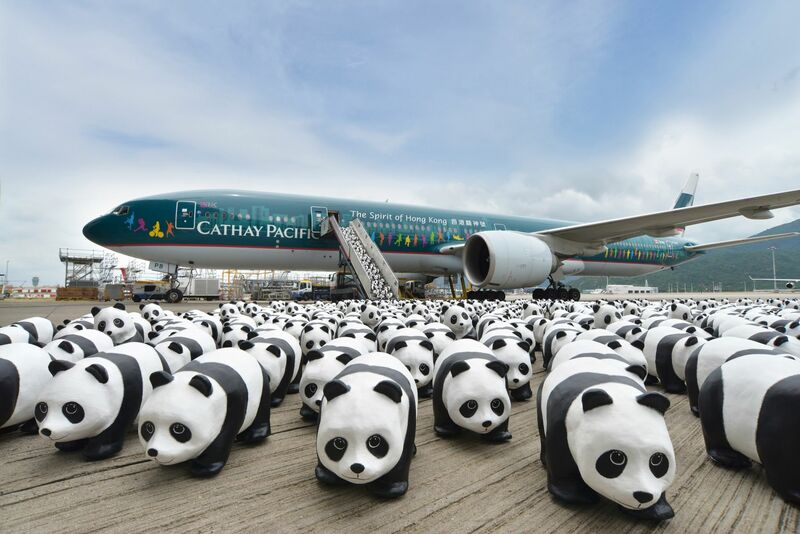 Cathay pacific was founded in Shanghai with a vision in mind that airlines would fly across the Pacific and today, this dream has been translated into reality. Cathay is now one of the premium airlines that flies across 200 international destinations and famous for its five star on-board customer service. In particular, flying business class with Cathay is a lesson in luxury with a strong focus on removing any potential hassle for the passenger including a fast and easy check-in, priority boarding and access to the premium lounge. The in-flight fine dining experience is also worth mentioning, with fresh produce, traditional Asian flavors and premium wine labels. Ultra comfortable, the seats come with two pre-set adjustments for sitting and sleeping, while in order to enhance the productivity of business travelers, they are also equipped with features such as expansive tables, privacy partitions and power outlets. On top of the business class amenities, first class suites aboard Cathay are private and luxurious, where you can even enjoy in-chair massages in a soft leather seat. Sleep suits, toiletries, skin care products, socks and sleeping masks are also provided to finish off an incredible all round service. Shanghai based China Eastern Airlines is another major player in the Chinese Aviation industry who have utilized technology n recent years to make their flights safer and more comfortable. Operating a number of Airbus A330-200s in the North America to Asia route, each China Eastern flight can offer up to 24 business class seats. A business class ticket provides access to the international lounge and recliner-style spacious comfortable seats in the flight itself. Courteous and friendly, China Eastern staff serve throughout the journey and personal television screens are stowed on the hand rest which include a selection of Chinese, American and European movies. In-flight dining options include both Chinese as well as Western menus with a selection of chardonnays also included. Although the A330-200s are not the front runners in the game of luxury, China Eastern is all set to raise the bar with a fleet of brand new 777-300ERs shortly. Unfortunately as of this moment, the A330s do not have first class cabins meaning China Eastern is often a second or third choice for business travelers who can afford more luxury. China Southern operates a number of flights connecting Asian destinations to Europe and America. Business class seats are spacious, comfortable and can recline to 180 degrees for comfortably catching a nap while they are also arranged in a 1-2-1 or 2-2-2 configuration meaning the added convenience of every seat having access to the aisle. With dedicated space to stow away a laptop, power outlets, expansive tables and adjustable privacy partitions, the business class seats aboard China Southern are great for both relaxing and working, while the in-flight dining options are delicious and come with a limited selection of alcohol. First class cabins are located in the lower deck of the planes and have plenty of privacy since the number of seats are low and as a premium bonus, first class passengers are allocated a spacious closet, along with headphones, slippers, pyjamas and a luxurious amenity kit. 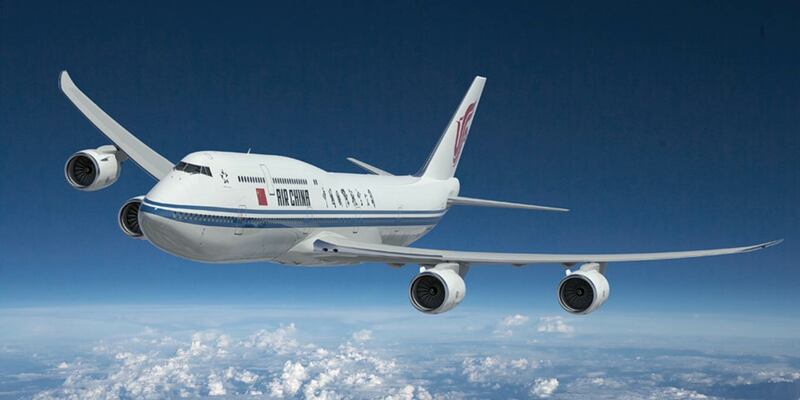 The flagship national carrier of the Peoples Republic of China, Air China was founded in 1988 and has since become synonymous with Chinese hospitality and work ethic. The Capital Pavilion Business Class seats are spacious, comfortable and recline up to 170 degrees, thus ensuring the fact that you can work and relax as you see fit. And then there is the Forbidden Pavilion First Class cabins which are luxurious private retreats in which travelers can enjoy the unique experience of oriental hospitality. As the courteous staff attends you, there is a particularly wide variety of delectable cuisine which showcases some beautiful Asian flavors. A selection of fine wine labels is also available and Air China goes that one step further by providing an airport limousine service for guests which ensures that the royal treatment does not stop even when you touch the ground. 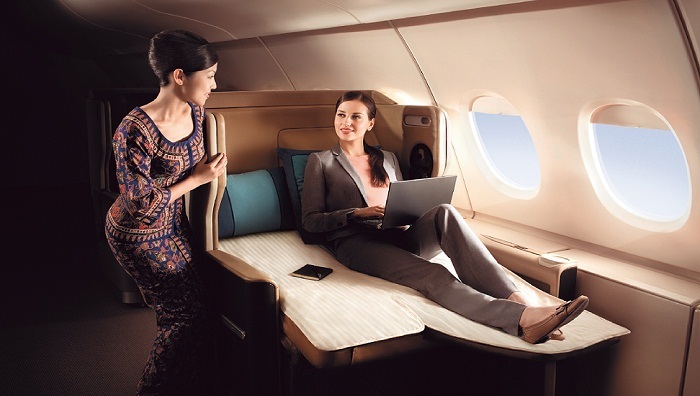 With more than six decades of industry experience, Singapore Airlines is a front runner when it comes to flying in Asia and make an inordinate amount of effort to ensure that the passengers have a luxurious journey. Hand-picked local flavors that are served by elegant hostesses in their traditional Sarong Kebaya uniforms, soft leather seats and a touch of oriental hospitality enhances the Singapore Air experience. The business class seats are crafted in premium leather and designed carefully keeping in mind both aesthetics and functionality. Thus, there is a place to stow your footwear, a place to hold your glasses, your pen and your laptop. 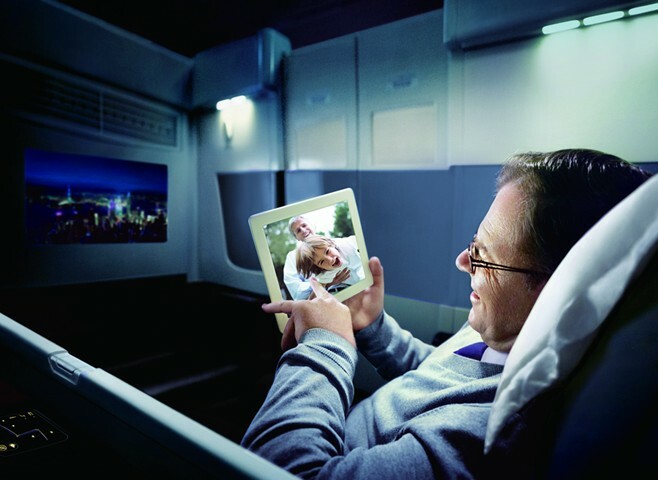 The business class seats in long haul flights also unfold into the largest full-length beds so that you have room to stretch and enjoy a good night's sleep. The first class cabins are exquisitely designed sanctuaries where you can enjoy adequate amount of privacy and stately treatment, while also boasting a state of the art entertainment system. Singapore Air heightens the First Class experience with the premium "Book the Cook" service where passengers can pre-order gourmet meals from a menu of exquisite global and Singaporean selection. 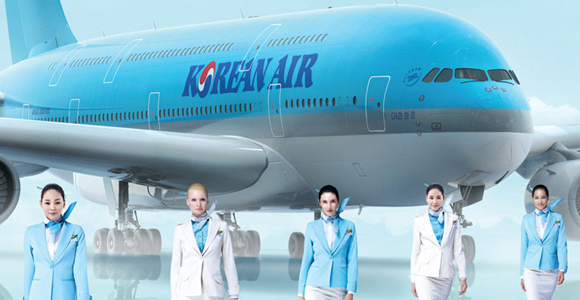 South Korea's largest airlines, Korean Air has not only established its place in the international aviation scene, but also mirrored the progressive nature of South Korea as a nation, making it no surprise how this airline has crafted a unique level of service when it comes to flying first class or business class. The business class or prestige class seats are comfortable and spacious, while the first class Kosmo suites are designed for private elegance. The full length beds, entertainment options and premium service characterize Asian hospitality and an in-flight fine dining experience including a selection of gorgeous Western, Korean, Asian and Japanese foods adds class to an already outstanding service. Long haul flights also have designer sleep suits that are stylish and you can also request a wake-up call service from the flight attendants. As Asian destinations keep popping up on the world map, Travgroup offers you an all access pass to the best of Asia and a taste of the exquisite oriental charm to travelers even before they reach their destinations. The joy of travel, as they say, is within the journey itself.